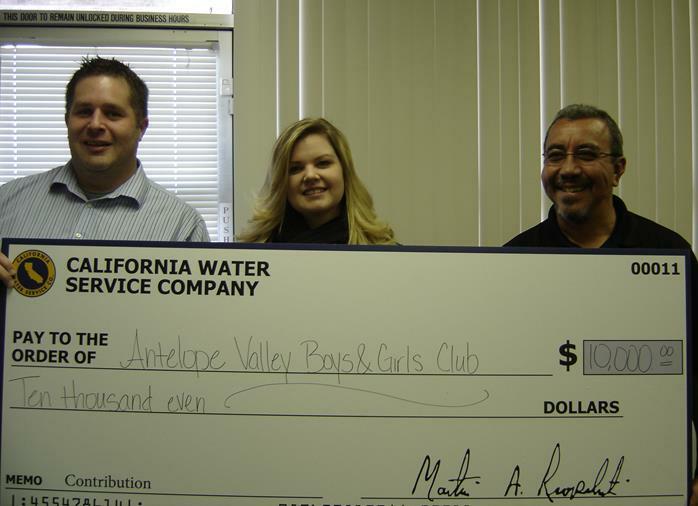 QUARTZ HILL— Local water provider California Water Service Company on Wednesday donated $10,000 each to the Antelope Valley Boys & Girls Club, the Antelope Valley YMCA, and the Leona Valley Improvement Association. The contribution is part of the company’s continuing effort to improve the quality of life in the communities it serves, according to company officials. Charitable contributions do not come from water rates, but from the company’s shareholders, according to Local Manager Chris Whitley. “It is important to us to be a good corporate citizen and support organizations that make this a better place to live. Our shareholders know that this means investing in worthwhile organizations like these,” Whitley said. The Antelope Valley Boys & Girls Club is committed to helping local youth reach their full potential; the Antelope Valley YMCA promotes healthy living and social responsibility; and the Leona Valley Improvement Association encourages family activities in rural Leona Valley. Cal Water serves about 3,400 people through 1,400 service connections in the Antelope Valley area. The company has provided water service in the area since 2000. For more information of Cal Water, visit www.calwater.com. 8 comments for "Cal Water donates $10K to local clubs"
I am also one of the unlucky ones with this water company! this is robbery, There is only 2 of us in the home and I work 12 hr days no grass in back yard only water once a week in front yard, run my dishwasher once a week and i do my laundry at the laundry mat (cheaper) no pool nothing! and still I pay close to 100 a month sometimes more. I am one of the unlucky ones to have Cal Water. Obviously they should have been able to give more than that considering how much they over charge! They are a rip off, and I think it is unfair we are forced to use their service, especially when less than a mile away people with LA water is paying like 1/4 of what I pay! Something has got to be done! They are breaking us! Seriously its winter time, and I am not watering and my bill is still over $100+ a month! I am one of the unlucky souls with Cal Water…..bill still close to $100 a month WITHOUT watering lawn…..obscene…. From what you just said probably confirms that the donation was in fact from overcharges. And this is the reason why things like education, health, and ultilies should not be traded in the stock market. Isn’t Cal Water the company that over charges local customers while their neighbors on LA Water pay less than half for the same or more water? This is the company that wants to raise their rates by 60% – yes that is S I X T Y percent, because people are saving too much water and its cutting into their profits. If Cal Water’s profits are less because of people conserving water, how are they able to donate $30,000 dollars to these organizations? Hmm . . . I am on LAC water and my neighbors in Littlerock pay half what I pay. They donate up and down the state, so it is more than $30K but they make millions so this is a small percentage of what they bring in.